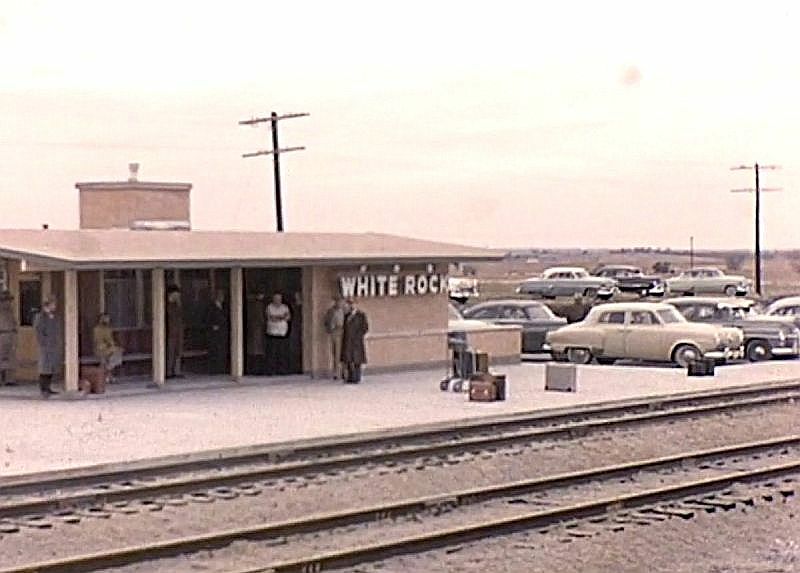 I was so happy to get word from UNT media librarian and film/video archivist Laura Treat this morning that she had come across film footage of White Rock Station, the first suburban train depot built in the Southwest by the Santa Fe Railway (in 1955). 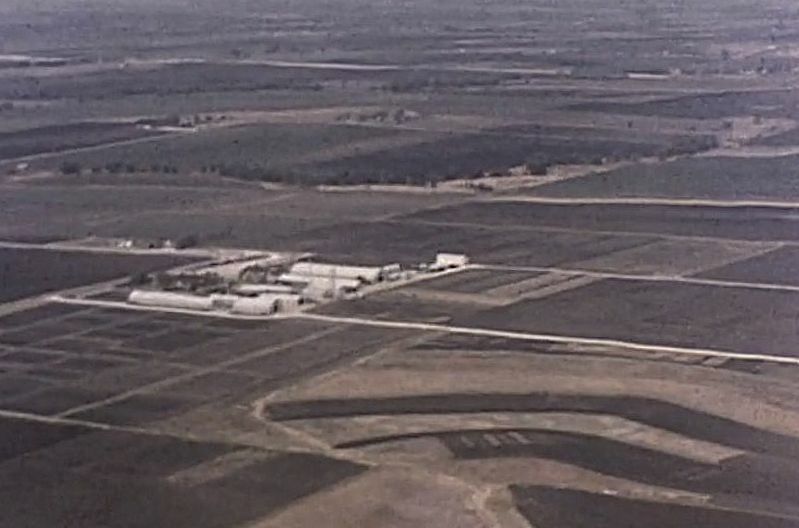 The footage is from the “Spotlight on North Texas” collection, a collaborative project between the University of North Texas Libraries and the Texas Archive of the Moving Image (TAMI) to preserve North Texas film history. This footage is from home movies donated by Mr. Peter Pauls Stewart. 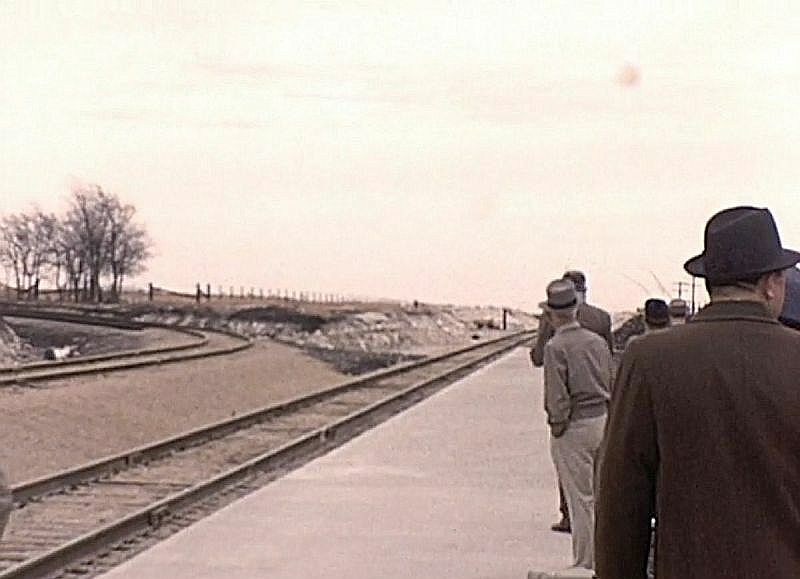 The 4-minute clip starts off with footage shot from a helicopter, showing brand new highways cutting through wide open land, followed by scenes of cute children and their cute dog, and then, beginning at the 3:00 mark, chilly-looking scenes of White Rock Station (which was located at about Jupiter and Kingsley on the edge of Garland, and which, today, looks disappointingly different) and a group of mostly men, some with cameras who appear to be train enthusiasts, waiting for the arrival of the Texas Chief. Doesn’t really look like Texas, does it? Below are some screenshots — watch the full clip on the Texas to Portal History site, here. 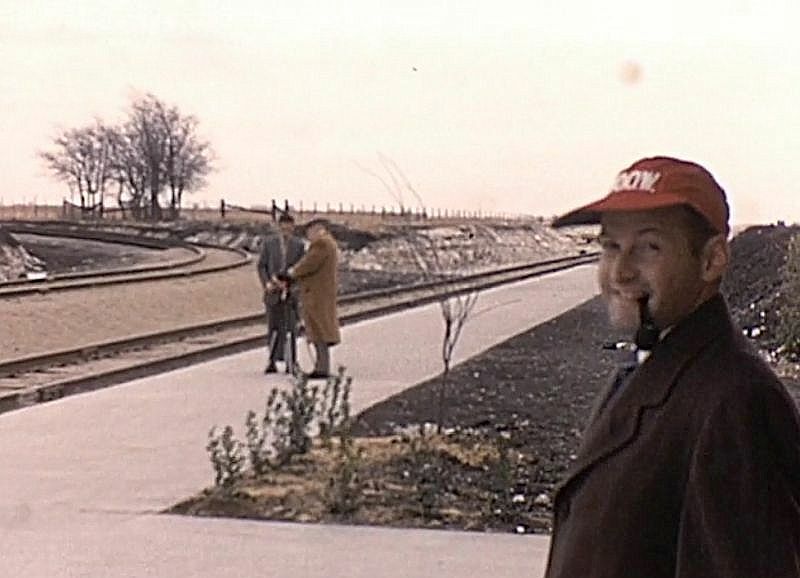 Above, two men set up a camera on a tripod as Mr. Stewart — the man who donated the footage — smiles at the camera and waits for the much-anticipated arrival of the train (which, be warned, is never actually seen in this film!). Below a couple of aerial shots of the North Texas countryside. UPDATE: In the comments below, Danny Linn writes about the aerial footage seen in the first minute or two of the clip: “… at the very beginning [of the clip is] a clear view of the old Highland Park Airport off Coit Road just north of Forest Lane. This portion of the clip also shows a fairly new Central Expressway near the future crossroad of LBJ Freeway.” Thank you, Danny! I assumed part of what we saw was in the LBJ-area, but wasn’t sure — another view of that area can be seen in a fairly startling photo of Preston and Valley View in 1958, here. 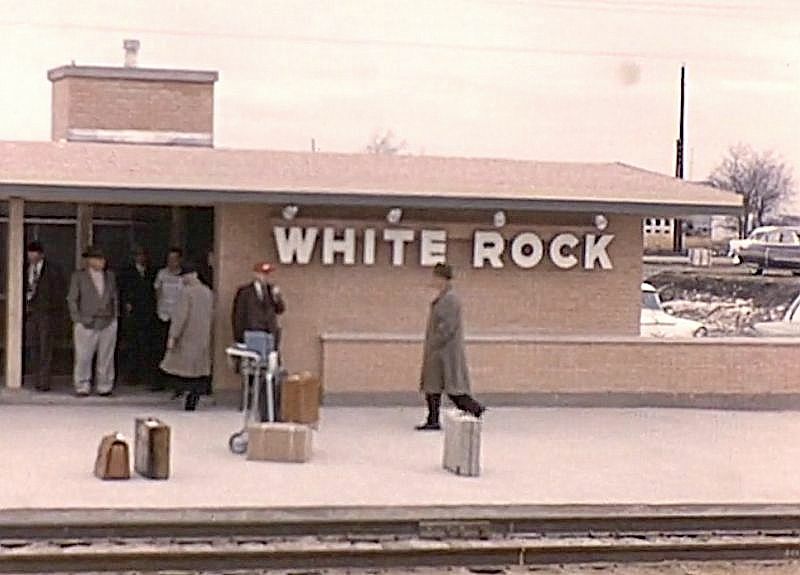 I have to admit that I had never heard of White Rock Station until I wrote about it in 2015, a post which has been surprisingly popular. The post — “White Rock Station” — can be found here. Haha. Not a diss, it just looks (to me) more like a commuter station you’d see in someplace like suburban New York. Wow, all that wide open space and I remember it all very well. 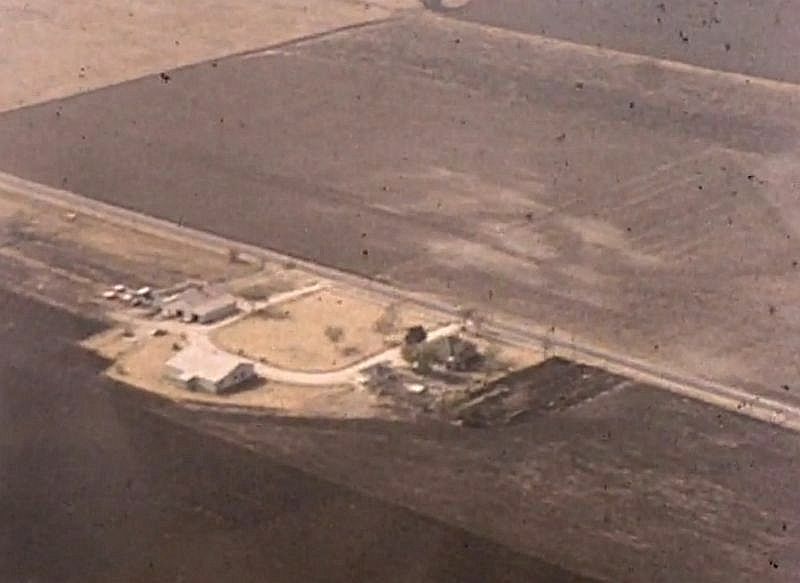 Great post Paula and another very interesting aspect of this film clip is at the very beginning showing a clear view of the old Highland Park Airport off Coit Road just north of Forest Lane. This portion of the clip also shows a fairly new Central Expressway near the future crossroad of LBJ Freeway. Thanks, Danny. I figured it was a general Far North Dallas landscape, but I wasn’t sure of any specifics! If you will notice in the photos there are two sets of tracks. The White Rock Station was located a few yards past Zacha Junction where the line split. 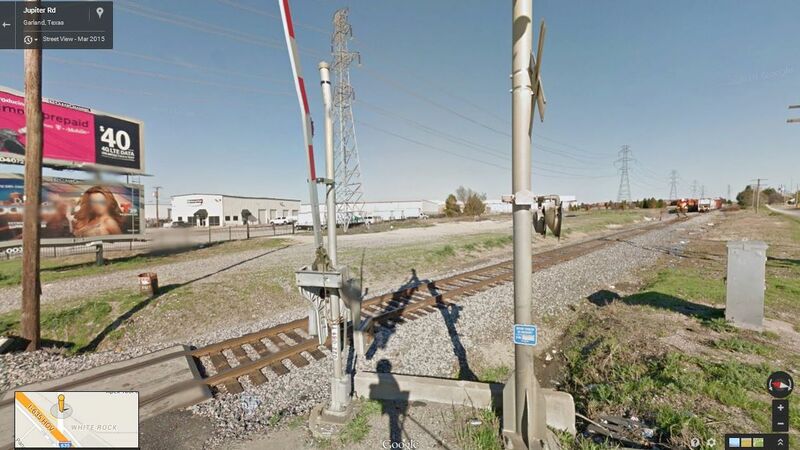 The curved line (Dallas Sub) went to Sanger and Dalton Junction (now Metro). The straight line the Paris Sub (now Garland Sub) went on through Garland to Paris.That would place the station location just several yards North of the Northwest Highway overpass. The area is now a huge fill in order to elevate the tracks over Garland Road and Northwest Highway. I always thought the Missouri, Kansas and Texas Railway built the first suburban train station in the Southwest in 1922 in Highland Park at Abbott and Euclid, which was the brain child of William George Crush. Thanks, Larry. My sentence was a bit confusing, but I meant it was the first suburban station in the Southwest built by *Santa Fe*.